Read the complete post to find the list top 30 high paying adsense alrenatives. There is no doubt that Google adsense is one of the best way to monetize your blog however all of us are not so lucky to get approved by adsense. I have seen many cases in which many newbie blogger left blogging when their account is not approved even I also left blogging for 6 months but later on I realized my mistake and now I am making decent income without any single adsense ads in my blog. While starting a new blog never keep adsense approval as your goal because adsense terms and condition are very strict and if you have done any mistakes, there is high chances of rejection. Your blogging carrier never ends when your adsense application is rejected because there are many different high paying google adsense alternatives in the internet to monetize your blog. After analyzing and comparing the PPC rate, minimum payout, CPC and their payment policy I came to the conclusion with the list of top 30 high paying google adsense alternatives. Here, I am going to show you some of the top adsense alternatives that will help you to monetize your blog to earn enough money without the approval of adsense. I am writing this post because, I just want to show that adsense rejection is not the end of your blogging carrier. why do you leave blogging if there are so many best adsense alternatives available? Never give up because your success is just a few step far and one day I am sure that you will earn decent income without adsense approval. 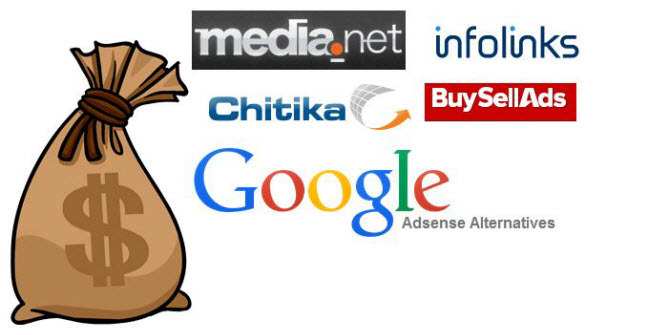 So, let’s get started and see the list of top 30 Google adsense alternatives. See: How you can make first 100$ from YouTube within 10 days. Media.net is one of the leading contextual advertising company that provides best advertisement and traffic monetization solution. Media.net is powered by Yahoo! Bing contextual advertising network and it also provides great alternative to google adsense. Although google adsense is considered as a high paying advertising company but you can try media.net because you will never find much difference between adsense and media.net. The best feature of Google adsense is that it provides relevant ads according to your website content. For example if your blog post is related with iPhone 5S review then it only provides the ads related with iPhone. Moreover, relevant ads will also increase the chances of click in the ads whereas there are less chances in irrelevant ads. Now, you can also enjoy this feature in media.net because it works exactly as Google adsense. As you know that adsense does support multiple formats of advertisement, similarly media.net also supports multiple variety of ad sizes and formats such as images, rich media, video, text etc. Its your own choice to create your ads formats according to your website color scheme, size as well as according to your own design. It is one of the great feature available in media.net. This feature will automatically boost your revenue by optimizing between text and display ads for every impression without running seprate ad tags. Infolinks provides four different types of ads to your blog infold, intext, intag and inframe. However I cannot explain all these types of ads but I will provide a brief introduction to each types of ads. The reason why infolinks is the best alternative of adsense because of its CPC and fast approval feature. Although the CPC of infolinks is not high as adsense but you can earn decent income if your website is getting most of the traffic from United States. As I already mentioned above infolinks provides 4 different ways to monitize your blog by using infold, intext, intag and inframe. Infold serves relevant ads to visitors related with the keyword they used in search engine before visiting your website whereas intext serves ads by double underlining the relevant keywords of your website content and whenever visitor hover overs it the ad is shown, intag servers ads by adding its double underlined keyword below your content and inframe serves ads by showing sliding ads in your website sidebars. It is one of the great feature of infolinks that you don’t have to worry about your application rejection. If your website have few contents and some few visitors you are eligible to apply for infolinks. Moreover its CPC is also good and if you get decent traffic from USA, Canada and other developed countries you will never find any difference between adsense and infolinks. Chitika shows the ads where and when you want to show them. It is one of the top advertising network with more than 350,000 high quality publishers and with access to the top-tier advertising partners like Yahoo! Supermedia and HomeAdvisor. Chitika also have trageting and optimization technology that provides right ads at the right time in your website. Affiliate Marketing is not about adding ads and getting paid for a each click instead it is about promoting others product in your blog. When some visitors click that link a special cookie tracks their activity on the website and whenever they sign up for their product you will get some percentage of commission for each sign up. You can see I have added some banners of Hostgator hosting because currently I am promoting their hosting and you will not believe that with in 14 days I have earned 250$ from their affiliate sales. I am not sure that how much you can earn from affiliate marketing because your earning changes according to the numbers of sales you have made. However if you are getting decent amount of traffic to your blog I am sure that you can earn far enough then adsense. I found that many professional blogger are even neglecting adsense because they are earning decent income from affiliate marketing. You can see allbloggingtips.com where Ammar Ali is not using any adsense ad in his blog because his making thousands of dollars from affiliate marketing. As you know that if you apply for any type of advertising program you have to wait for your application to be approved but in case of affiliate marketing you can start earning just by creating your account. There is no any waiting time period for your application to be reviewed and even you don’t need any website/blog to start earning from affiliate marketing because you just have to promote and sale their product in any manner. If you have recently launched your blog and have lack of visitors then clicksor will be a best alternative for you to monetize your blog because there is maximum chances of approval and then you can start displaying clickable text or targeted contextual advertising banners in your blog. All other ad network except provide payments at the end of the month it means that you have to wait for 30 days to recive your payment but in clicksor payment are issued within 15 days and you can even receive upto 85% of ad income. A dedicated support team will be available for you upon your account creation and you can even get full support using phone, email and live support.ge. You can even set your own minimum prices for CPV, CPC, CPM and CPI ads. You can even earn 10% extra income by referring a publisher or advertiser on the clicksor network. It is considered as one of the best alternative among all adsense alternatives and unlike Clicksor it requires more traffic to get accepted. However the CPC of exponential is higher than clicksor but application approval rate is much lesser. Although it is much harder then clicksor to get its approval but the CPM, CPC and payment methods are much convenient then other networks. Moreover Exponential work much harder to secure highest eCPMs, heavy budget and appropriate advertiser for your blog. Exponential provides most dynamic, relevant and engaging ads to engage your audience and to encourage them to click on those ads. Their fully optimized ad formats helps to engage your audience across any display like on PC or mobile. Based on site performance, website content and targeted visitors their server efficiently connects to the advertisers campaign with the audience that your site offers, which guarantees your maximum revenue. Kontera provides more advertising revenue to their publisher from their mobile or PC web pages. Like adsense kontera also serves highly quality relevant ads according to your website content and as a result their ads are often viewed as native ads that are less disruptive for visitors. Moreover they also provide unique mobile and in-content monetization option that helps to double your ad revenue. As the name suggests buysellads directly deals with buying and selling ads. You apply for a publisher account and after approval advertiser will purchase an ad space in your blog/website. Since, buysellads is a very huge network therefore you site must meet the visitors criteria to be a publisher. It is very hard to get approved if you website is not getting decent amount of organic traffic but earning at buysellads is under your control because you can charge your own amount for ads to be displayed on your website. Adversal is another great high paying adsense alternative and it is best for newbie bloggers who have recently started a blog and searching for a monetization platform. It also provides 100% fill rate with highest available eCPM by bidding your ad space on 100’s of advertisers. iSocket is one of the the best advertising solution for your blog because every order is directly made between you and the buyer. You set the pricing of ads and can control visibility of the inventory to the buyer. You can even start a private deals and can create custom ad packages for your sustainable customers. Adsense application rejection is not the end of your blogging carrier instead you can try these best high paying Google adsense alternatives that I have mentioned here. I hope the list that I have provided here will probably help you to find the best adsense alternative that fits your requirement. Now all I am looking for you is your nice and honest opinions in the comment below and if you have any suggestion regarding adsense alternatives please do comment below. Adtomatik is another adnetwork to let you monetize your website. Adtomatik guarenties that your inventory is 100 percent utilized. I highly recommend it. Hi ojha, i applied for google adsense. but google disapprove my request saying “insufficient content” .. what does it mean? how can i overcome this problem? Hi Warda, it means that you do not have enough blog post to show adsense ads therefore you need to write more contents to get its approval. “In some cases, many bloggers and marketers want to know some top paying or high-paying adsense alternatives. Yes, Tim, you are correct. Thanks for this list of Adsense alternatives. For people that do not trust Adsense or have lost their accounts this is very valuable information. Yes, you are correct Brenda but I think it’s better to have something instead of nothing. I mean most of the beginner cannot easily get an approved adsense account so at that time they can use these alternatives.